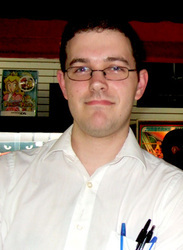 James Rolfe is the creator and mastermind behind Cinemassacre.com, a highly successful internet destination for comedic, nostalgic and informative pop culture entertainment. He has created more than 300 films in his career, and has become an icon in the gaming world with his hit web series The Angry Video Game Nerd. He has garnered an impressive cult following on Youtube, with over 600,000 subscribers, 260,000 Facebook fans and 46,100 Twitter followers. James creates content for Spike.com, GameTrailers.com, and MTV. He's been interviewed on Opie & Anthony (XM radio), featured on CNN Headline News "News to Me", featured on G4's "Attack of the Show", and was the winner of Mashable's Best Web Series of 2009 for The Angry Video Game Nerd. James' other popular series' include Board James, and You Know What's Bullsh*t? He is currently in post -production of his first feature film, Angry Video Game Nerd: The Movie.